It doesn’t get much better than a warm, homemade bowl of thick tomato soup and good times with old friends. I’m lucky enough to get both this weekend, but let’s start with the soup. My younger self would not have agreed with you on the soup part of the above statement. Every time my mom served grilled cheese and tomato soup, I slurped a little at the soup and made sure to lick that grilled cheese plate good and clean! I’m not sure if it was too plain or if my taste buds were just not into tomatoes at the time, but sometime down the road that changed. Maybe I got desperate in the college cafeteria? I couldn’t tell you exactly when or how the conversion occurred, but a lot of the foods I crave most now include plenty of big tomato flavor. Grated parmesan cheese is one of my favorite ingredients, and it’s so easy to make in a hurry I knew I had to share it with you in the new series on NCK: homemade how-to. I’m perfectly happy just sprinkling it over some saucy pasta, but I wanted to share a little more unique recipe to put our new parmesan grating skills to work. 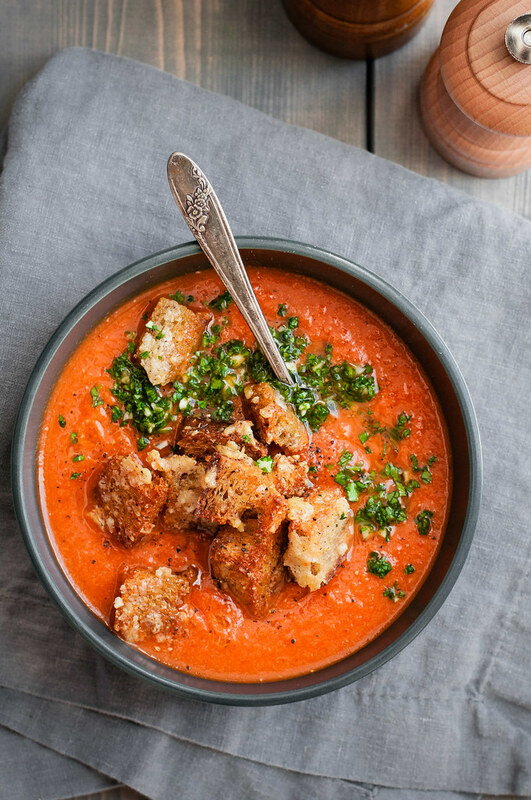 The answer is cheesy parmesan croutons so packed with flavor you’ll swear there’s more than just three ingredients. Trust me, I could easily eat a full tray of these croutons without anything else and be totally happy (and ashamed), but they deserve a companion that is not salad. 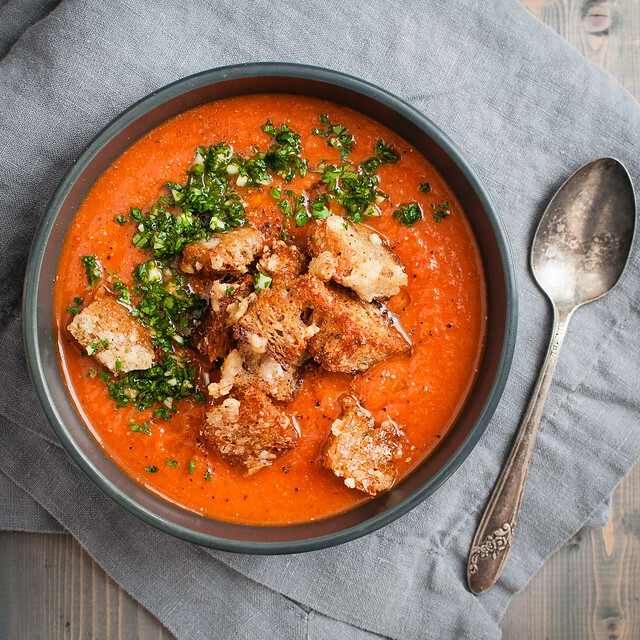 How about…creamy, thick tomato soup with exactly no dairy and no gluten? 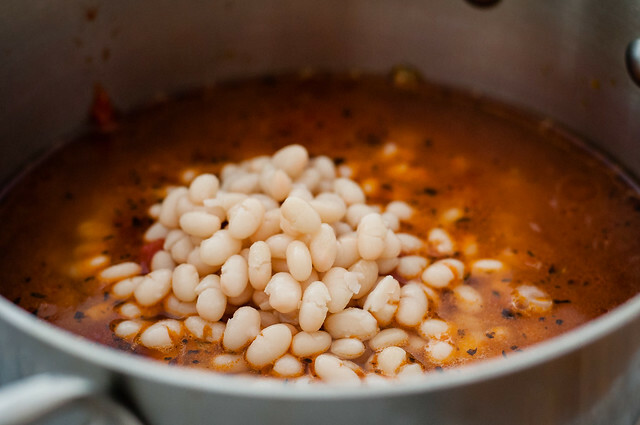 No roux, no cream, but you end up with hearty results by simmering and blending in tender white beans. 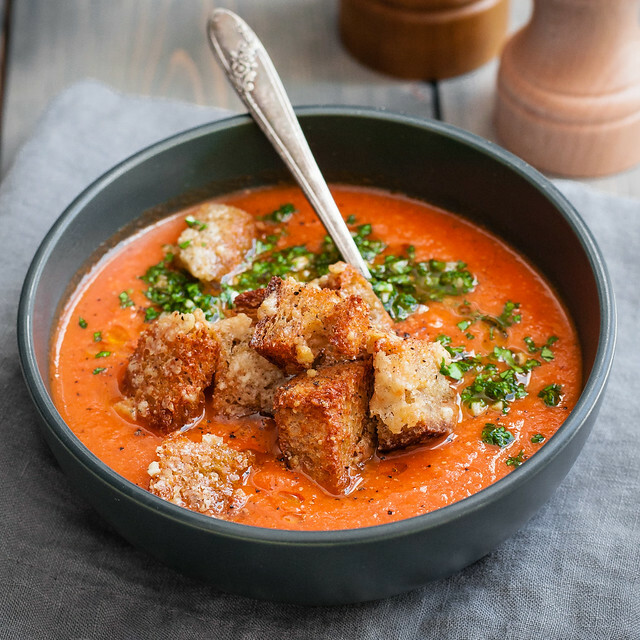 The soup itself is vegan, but I realize that’s a moot point when topping it with parmesan croutons. Still, it’s on the healthy side, and instead of the traditional heavy, buttery grilled cheese (which has a place in my life, don’t worry) we manage to keep it that way even with the addition of a few indulgent toasted chunks of bread. 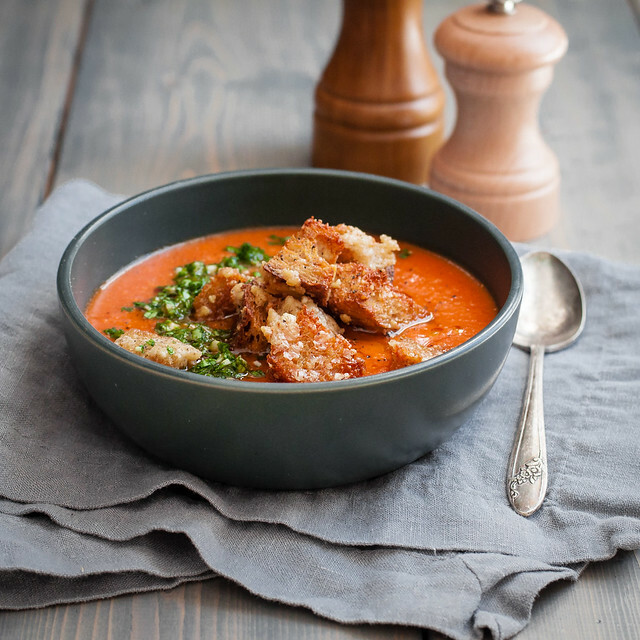 It’s classic tomato soup and grilled cheese, all grown up. All grown up, kind of like my friend Amanda and I since we last saw each other over five years ago. We shared many a late night sleepover in high school, complete with her crazy cat, but our circle of friends grew apart as life brought us all new experiences in different parts of the world. This fall, she had the courage to act on her dreams and head to NYC for a masters in design, placing her not too far from our residence in Connecticut. When she was thoughtful enough to text me last week to find out when we could meet up, I was thrilled to reunite and hopefully find our old familiarity. Found it we did! It was almost like seeing family, and we caught up over an old style sleepover with one very important addition: wine. And also one husband and a funny pug. It was just the reminder I needed after a week of hiccups. NCK went down for a bit for reasons I couldn’t figure out until my tech-savvy hubs stepped in, and I had a disastrous breakfast taco photo shoot. Like, this iPhone pic is better than any photo I took with the “real” camera. But, a full 24 hour break filled with good food, excellent company, and gorgeous weather reminded me to cut myself some slack on occasion, and I’m returning today refreshed. 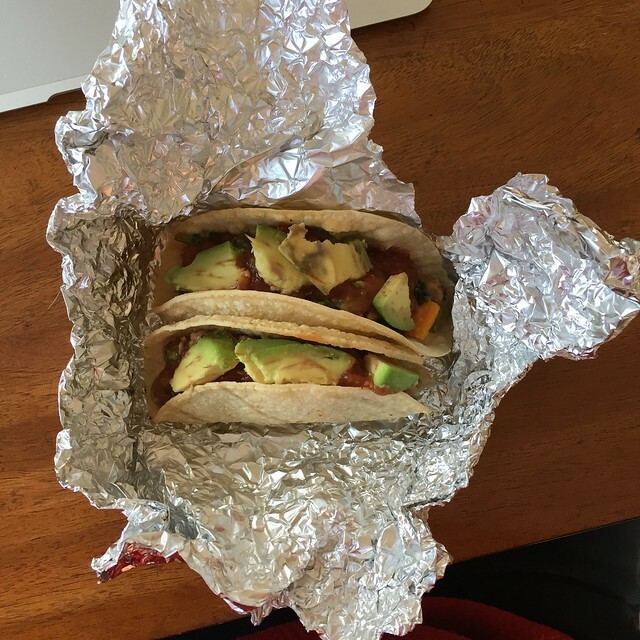 I’ve got all the energy I need to play catch up and take new pictures of the tacos! Of course, a new idea for shooting them popped into my head once I let go of the subject. Predictable. You’ll be seeing these tacos in all their real camera glory later this week, so check back. Until then, have a happy start to your week, and don’t forget to cozy up with an old friend and/or your favorite bowl of soup! In a medium pot or sauce pan (about 3 quarts), heat olive oil over medium heat. Add onion and dried basil and cook about 5 minutes, until onion is soft. Stir in tomato paste for a minute or two until blended, then add diced tomatoes, baking soda, stock, and beans, and bring to a boil over medium high heat. Reduce heat and cover, and simmer the soup for 20 minutes, stirring occasionally. While soup simmers, mince the garlic and fresh herbs together, if using, and set aside. Remove soup from heat and cool slightly, then blend in batches or with an immersion blender until smooth. Return soup to the pot to keep warm over low heat, and season with salt and pepper to taste. Serve with a drizzle of olive oil, black pepper, the herb mixture, and parmesan croutons. Preheat oven to 400 (F). 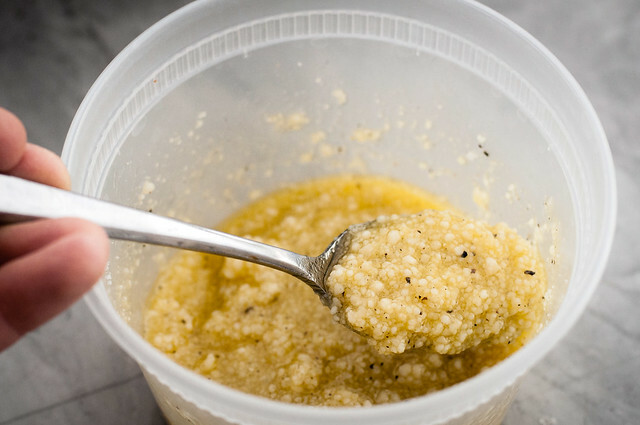 Mix oil, parmesan, salt, and a few grinds of black pepper to form a paste in a small bowl. In a mixing bowl, toss bread cubes with the cheese paste. Spread on a rimmed baking sheet in a single layer with as little space as possible between cubes. Bake for 5 minutes on the middle rack, then stir and bake another 5 to 10 minutes, until golden brown. 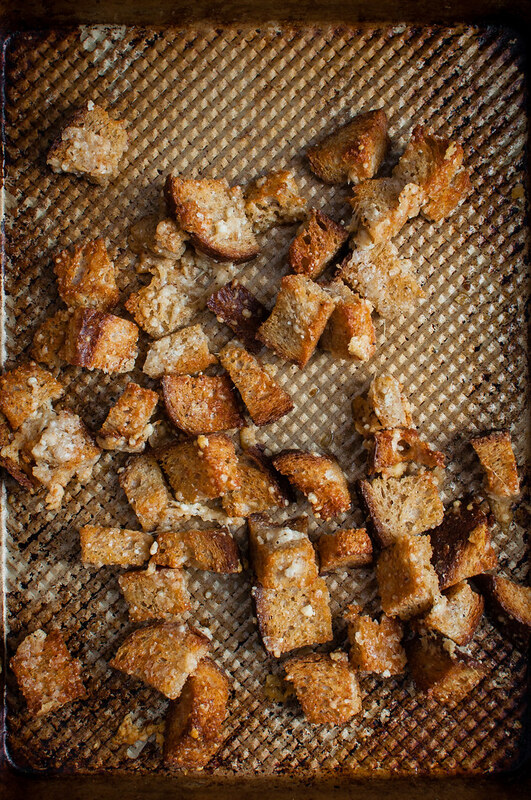 If some of the croutons stick together, that's fine (and encouraged)! 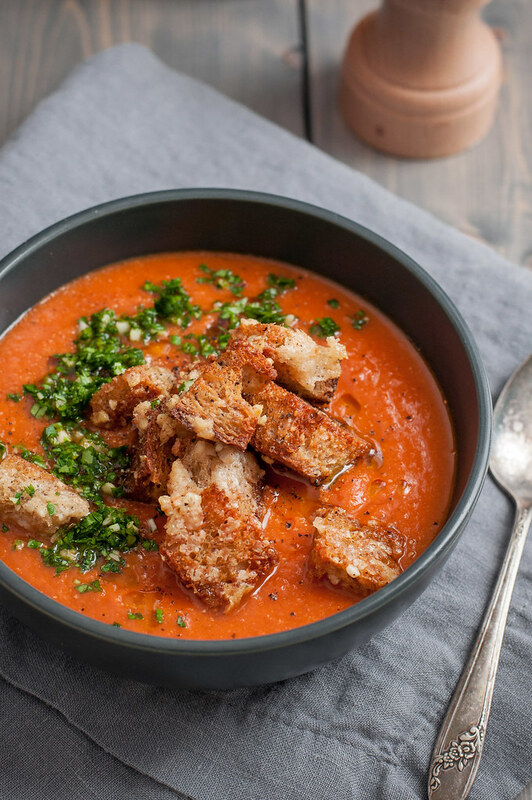 Cool for a few minutes, break apart most of the croutons, and serve a handful over each bowl of soup. Soup adapted from The New Vegetarian Cooking for Everyone, by Deborah Madison. 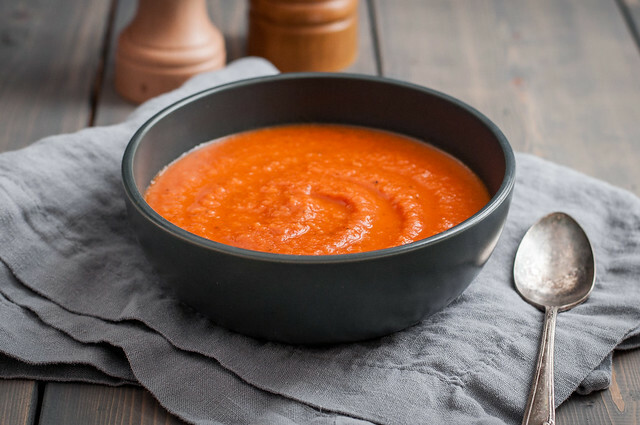 Baking soda allows the tomato flavor to come through, while reducing acidity. Without the croutons, the soup is vegan and gluten free. Note: This page contains affiliate links. It does NOT contain sponsored content. 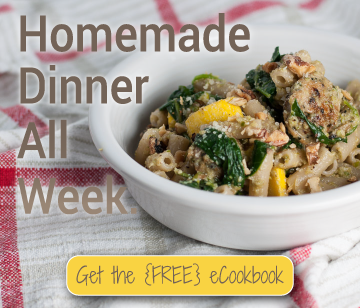 Affiliate links (to products I recommend, on Amazon) offset my ingredient and website maintenance costs, so I can keep bringing you surprisingly healthy recipes like this one. Thanks! Thanks Sarah! Me too since it’s pouring cats and dogs here…I’m tempted to go defrost the leftovers in the freezer!